Physicists propose that violations of a fundamental law of physics in early stages of the universe are responsible for the mysterious dark energy. Physicists have proposed that one of the fundamental laws of physics, the law of conversation of energy, had a “violation” in the early stages of the universe. This could explain the issue of the “cosmological constant” which has troubled physics since Einstein and has been linked in recent physics to the emergence of the theorized dark energy. The “cosmological constant” is a controversial topic in physics, believed by some, rejected by others. It’s been dubbed “the worst theoretical prediction in the history of physics." Einstein added the cosmological constant, a mathematical term, to his theory of general relativity in 1917 to address a bewildering problem of “vacuum energy”. The constant is supposed to represent an anti-gravitational force. It was believed at the time the Universe was static and the equations just didn’t make sense to Einstein as they predicted the Universe was expanding. "The term is necessary only for the purpose of making possible a quasi-static distribution of matter, as required by the fact of the small velocities of the stars”, Einstein wrote at the time, somewhat begrudgingly. Of course, when observations by Edward Hubble in 1929 proved the universe is actually expanding, Einstein gave up on the constant and most cosmology researchers set the constant to be zero. In fact, Einstein was rather disappointed with himself for utilizing the constant in the first place, reportedly calling it “the biggest blunder of my career”. But in early 1990s, further observations saw that the universe is not only expanding but at an accelerating rate. This is when the constant came back under consideration, this time to reflect the influence of the theorized “dark energy,” which is predicted to make up about 68% of the known universe, affecting its acceleration. One big issue with the new vision of the constant has been is that there’s a large discrepancy, up to 120 orders of magnitude, between its predicted and the small observed value. What the physicists Thibaut Josset and Alejandro Perez at the University of Aix-Marseille, France, and Daniel Sudarsky at the National Autonomous University of Mexico, propose is that there is an “unexpected relation” between “the acceleration expansion of the universe and microscopic physics”. What they are saying in their new paper is that there were tiny violations in the law of conservation of energy during the early stages of the universe. They were small enough to not be replicable by modern experiments, but their existence affected the cosmological constant as we know it today. How could a basic law of physics be broken? The possibility is that on the grand cosmological scale, it doesn’t work quite the same way. In particular, violations of energy conservations have been investigated in relation to such phenomena as the creation and evaporation of black holes, the collapse of the wavefunction in quantum mechanics, and the recombination period of early universe when photons decoupled from electrons. "Energy from matter components can be ceded to the gravitational field, and this 'loss of energy' will behave as a cosmological constant—it will not be diluted by later expansion of the universe," said Josset. "Therefore a tiny loss or creation of energy in the remote past may have significant consequences today on large scale." One way the physicists suggest to regard their idea is that the cosmological constant (and its incarnation as "dark energy") could in essence be a kind of historical record of instances of energy non-conservation. It would actually not be that constant, varying based on the energy flows in the universe. "In the model, dark energy is something that keeps track of how much energy and momentum has been lost over the history of the universe," said Alejandro Perez. 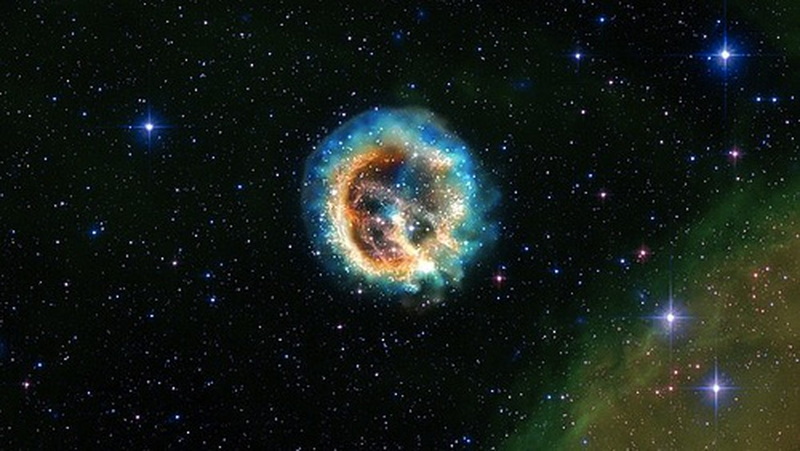 While there is no current method to test if they are right, the physicists plan to continue research into the matter, with possible future tests like observing the expansion of supernovae. "Our proposal is very general and any violation of energy conservation is expected to contribute to an effective cosmological constant," explained Josset. "This could allow to set new constraints on phenomenological models beyond standard quantum mechanics. On the other hand, direct evidence that dark energy is sourced by energy non-conservation seems largely out-of-reach, as we have access to the value of lambda [the cosmological constant] today and constraints on its evolution at late time only." If the scientists are correct in their hypothesis, their ideas could lead to a total rethinking of the law of conservation of energy. "Just as heat is energy stored in the chaotic motion of molecules, the cosmological constant would be 'energy' stored in the dynamics of atoms of space–time," pointed out Perez. "This energy would only appear to be lost if space–time is assumed to be smooth." Some scientists have come out in cautious but optimistic support of this work. As reported by Edwin Cartlidge of "Physics World", Lee Smolin from the Canadian Perimeter Institute for Theoretical Physics in Canada, was supportive of the challenging idea, calling it "speculative, but in the best way". He also added that the idea is "probably wrong" but would be "revolutionary" if proven correct. You can read their paper “Dark Energy from Violation of Energy Conservation” here, in Physical Review Letters.